Amy and Dan Cahill, two orphan siblings, live with their aunt Beatrice. One day they get news of the death of their grandmother Grace Cahill. They go to the funeral to say good bye to their grandmother, and encounter a huge crowd. The crowd consists of every Cahill on the planet. Their family was even bigger than they imagined! After the funeral, they are invited to the reading of Grace’s will in her mansion. The will gives each Cahill an option of two inheritances: a million dollars or the chance to participate and win the biggest competition on this planet called the 39 Clues. Amy and Dan choose to participate in this contest. 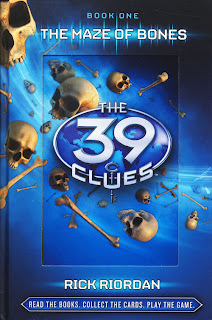 This leads them on a quest, a quest to find the 39 Clues that will make them the most powerful people that ever existed-if they find them- and to finding out more about themselves and their family.